Irvine’s ancient tollbooth had served as both the town’s jail and townhouse since the 14th century. By the mid 19th century, however, it was considered unfit for its use as a jail and was also an encumbrance to traffic as it sat in the middle of High Street. It was decided in 1856 that a new building was required. Many sites were considered for the new building, with the eventual choice being the site of the old flesh market, just a little further along High Street from the original tollbooth. Kilmarnock architect, James Ingram, known for his “attenuated Italianate style, was chosen to design the new building at a cost of £4,000. In 1860 the Provost, Thomas Campbell, was so opposed to the Italianate style of the building that he boycotted the ceremony for laying the foundation stone which was laid by Bailie John Niven. Construction was completed in1862, the official opening being in May of that year. After his death however, a portrait of Provost Campbell was placed inside the building. The new Town House provided a Council Chamber and Court House; it did not contain prison cells as a new police station, complete with prison, had been built behind it in 1860. There was accommodation for the JP Court, Road Trustees, the Presbytery, the Collector of Customs and Irvine Reading Room. The Hall was available for the horticultural show, dancing classes, the Choral Union, concerts and balls. 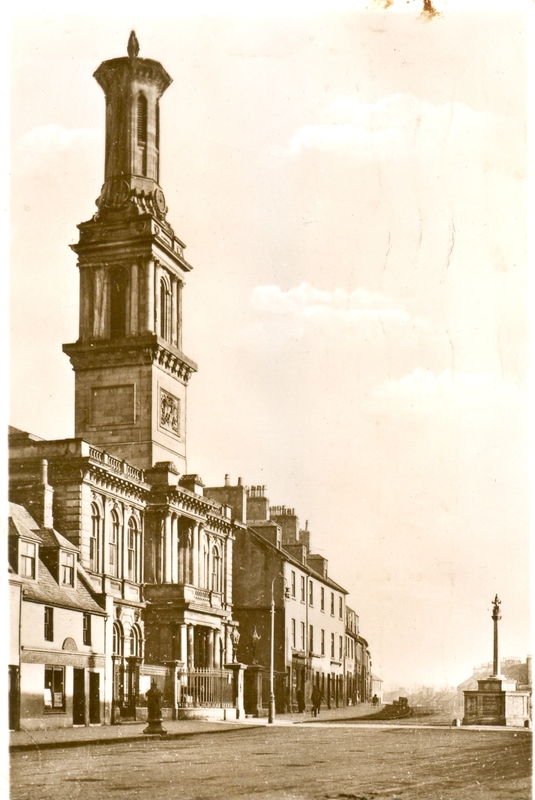 Above the Town House is a handsome clock and belfry, terminating in an octagonal steeple. One item from the old Tolbooth was brought over to the new building –the weathervane in the shape of a sloop, recalling Irvine’s past glory as a major port in the days before the dredging of the River Clyde. In all the building is 120 feet high. The town house originally had a perimeter fence with decorative iron railings and two gas lamps, one at either side of the entrance gate. These were removed during World War II to help the war effort. The new townhouse did not contain prison cells as a new police station, complete with prison, was constructed behind it in 1860. The old tollbooth was torn down in 1861 and its stones were used to reinforce the river bank.